An award-winning face painter in Canada, Shannon Fennell, heard all the talk about Reef Botanicals Purity soap and had to try it for herself. She bought four bars, a heck of a commitment for a product she'd never tried before! Is that cool or what? She's another Ivory convert, as was I. And her post precipitated another sale, to another Canadian face painter who was sold on the efficacy of Reef Botanicals soap. Looks like Purity is the hot new thing for face painters! The best thing? It works just as well on faces for getting the makeup off. It's gentle and has no allergens, so it works great. I use it on my own face every day. Tonight was another meeting of the northern NJ Face & Body Art Guild, and I was finally able to make it again. I've missed several meetings because of the show and rehearsals. Now that we're out of rehearsals, and in fact there's only one weekend left, I've got time. And I am now, quite literally, a card-carrying member of the guild! This month's meeting was especially valuable, as we had a guest teacher to lead our workshop, Pashur. Yup, the same great guy whose class I took back in November. He's really a great person in addition to being a great artist, and it was fun to see him again. In addition to a great new parrot design, he showed us ways to really improve our sharks. Plus, I learned this great tattoo-style rose that, when filled in and shaded, is similar to an Ed Hardy look. Polished up, filled in, shaded, and surrounded by some tribals or thorny vines, this will be a phenomenal addition to my repertoire. The best part of Pashur's workshops are the games that get you to push your boundaries. One game was to fingerpaint fifteen 3-color roses with a vine, leaves, and a bumblebee... first person to finish won, so we needed to move fast and throw skill and "pretty" out the window. The range of outcomes was hilarious. Mine was second from the left. I can't wait to put my new skills and ideas to good use! Yesterday, Eric and I traveled into the Bronx for my friend's 39th birthday party. We got there several hours after the child-friendly, mid-afternoon party had started, since I had a performance yesterday afternoon. As it started to get dark, some of the younger revelers were getting tired and getting a little sensitive with each other. Face painting, of course! I keep my kit in the car except when I bring it in between gigs to clean it, and so it was right there in the back seat when I needed it. It was perfect, and I was happy to do it. Eric and I didn't tell them what we were doing when we went to the front of the house, and the smiles started as soon as I opened my kit and started to set up. My friend's daughter has been face painted many times, but never before by me. She asked for a butterfly, my most requested faced, and let me match the colors to her outfit. A young neighbor managed to hit upon my second most requested face, the tiger. Even the ones who didn't want to actually get painted were engrossed with the process, and just watching me paint kept them entertained for a bit. By the time I finished, it was just getting too dark to see and the kids were happy and ready to play together again. Between each face painting gig, I bring my kit(s) into the house and wash each brush and sponge that I've used. I'm sure you find this to be good news, right? Now, as a fine artist, I'd been taught to use Ivory soap to wash my brushes when oil painting. 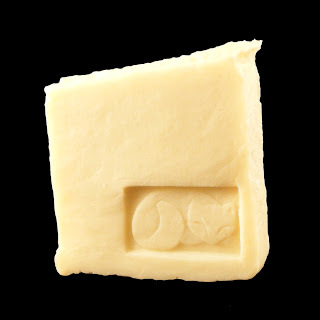 It makes sense as a nearly-pure soap that cuts through the oils really well. So when I started face painting, it made sense to me to do the same with my face painting brushes. Granted, face paints are really makup and not paint at all, and they're therefore not oily, but they are highly pigmented and can stain sponges and brushes something fierce. I stopped that. I've started using Purity pure Castile soap instead. Yes, I make it myself. When my husband and I started our soap business, Reef Botanicals, I posted it here. Well, now it's flourishing! Not long ago, Mark Reid espoused the virtues of cleaning his sponges and brushes in a pure Castile soap. He bought some Purity and raved about its success. Since then, other face painters have followed suit. OMG it cleaned my brushes and sponges SO WELL! Brushes that had been black with Wolfe black for like months came back to a light shade of gray... I couldn't believe it. 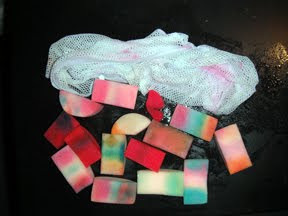 I had used all kinds of other stuff on them and they never came that clean! My golden taklon ones turned back to their golden color! Amazing! ... STRONGLY recommend trying that stuff. It's awesome! 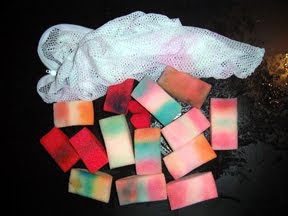 She pointed out the overall pink tinges of the lighter-colored sponges, which were originally a very light peach, and the pink stains on the formerly white lingerie bag. 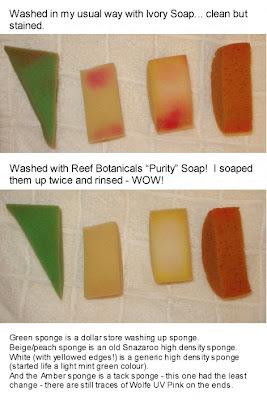 She'd spent "a good five minutes squishing, squeezing, resoaping, rinsing and rerinsing these sponges." They were washed until the water ran clear with the last application of soap, which meant three rounds of soap. They're better and brighter, but the bag is still stained and there's still a good amount of face paint staining the sponges. She had again washed and rinsed until the water ran clear, which took two applications of the dishwashing liquid. 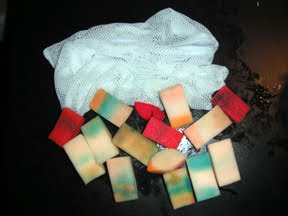 It took two rounds of soap and they're still a bit stained, but the sponges themselves have returned to their original pale peach color! They are bright and not nearly so embarrassing for a face painter to pull out of her kit. And did you notice...? No stains on the lingerie bag! Even better, since you know that Purity is safe for use on the face, if there's any residue on the sponges or brushes, it won't hurt anyone if transferred to a face during face painting. There are no allergens here, since it's completely color-, fragrance-, and additive-free! This would work for any cleanup, though. Even though face paint is really makeup and not paint, this would work just as well for oils, acrylics, watercolors... after all, in my many years of art classes I was taught to wash my oil paint brushes with a bar of Ivory. What could be better than that? Purity!